This page is for the 2019 GOTY Enhanced version. 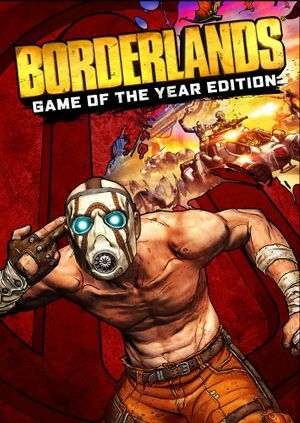 For the original 2009 version, see Borderlands. Remastered version of Borderlands featuring improved lighting, textures, character models, gameplay tweaks and all DLC from the original release. Free for Steam owners of the original version, even if they don't own any of the original version's DLC. Allows importing saves/characters from the original version. 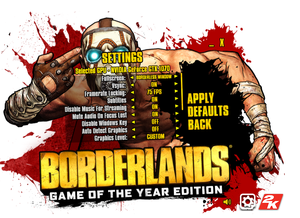 All versions come bundled with the original version of Borderlands. In the main menu, navigate to Options followed by Game Options. Go down to the bottom and set Disable Launcher and Disable Startup Movies to ON. Does not synchronize configuration files. Vert- by default. See Ultra-widescreen. 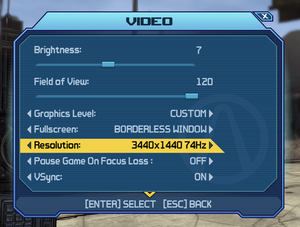 Replace BorderlandsGOTY.exe in the game folder. All supported resolutions unlocked in the game menu. Hor+ (set FOV to 70 to get the same FOV as in the non-enhanced version). If graphical issues occur with multi-monitors, disable in-game FXAA and use FXAA via driver or ReShade. No mouse acceleration, although mouse smoothing is present but can be disabled through config files. Separate sensitivity sliders for non-scoped and scoped aim, as well as horizontal and vertical movements. Game launcher requires a mouse to navigate, although the launcher can be turned off as an in-game option. The D-Pad, View and Menu buttons cannot be remapped. Keyboard and mouse is prioritized over gamepad input. Launch the game once after installing in order to generate config files. The below two fixes should help alleviate some lag experienced while playing with other people. In the main menu, navigate to Options followed by Video. Voice-over-IP sends a lot of packets even when turned off in game unless disabled through the config files. ↑ 1.0 1.1 File/folder structure within this directory reflects the path(s) listed for Windows and/or Steam game data (use Wine regedit to access Windows registry paths). Games with Steam Cloud support may store data in ~/.steam/steam/userdata/<user-id>/729040/ in addition to or instead of this directory. The app ID (729040) may differ in some cases. Treat backslashes as forward slashes. See the glossary page for details. ↑ The config file %USERPROFILE%\Documents\My Games\Borderlands Game of the Year\WillowGame\Config\WillowEngine.ini includes HDR related parameters in the [HDR] section, but the game falls back to SDR shortly after launch.